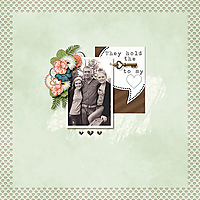 Created with Key to my Heart by Dandelion Dust Designs! $2 today! So pretty! Love your layering and your clusters are beautiful! Your word art is great! Nice job! That is a great photo you and your hubby, Beckie! Love the papers you paired together to create all the wonderful squares, circles and rectangles. Fabulous clusters as well.